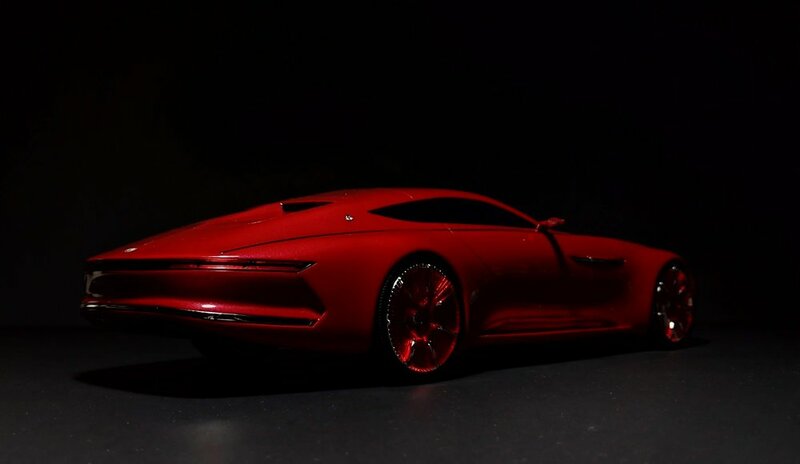 Concept cars are the ultimate tease. The epitome of form over function, these sculptures serve as design studies that manufacturers love to show off just because they can. They put together fancy debuts that garner tons of press attention and then tell us straight to our faces that they’re not actually going to produce them. There’s no denying that these are exquisite works of art on wheels, but they are purely for your eyes (and imagination) only. Enter the Vision 6, an all-electric, ultra-luxury land yacht that, with its massive length, stretched hood, slim wing mirrors, severely limited rear visibility, and monstrous 24-inch wheels, isn’t something you’d want to drive anyway - at least not on a regular basis. Designed in both coupe and convertible formats, it’s nonetheless a stunning masterpiece and a modern take on iconic classics such as the Bugatti Type 57 and Rolls-Royce Phantom. 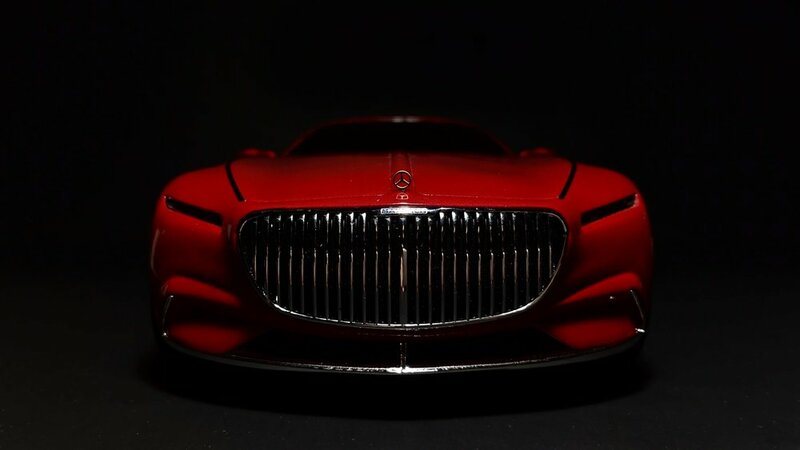 Schuco produces both forms of the Mercedes-Maybach Vision 6, of which the coupe is shown here in red, representing the same show car that debuted at the 2016 Pebble Beach Concours d’Elegance. Unlike many of their other models, this one is sealed resin as opposed to diecast. 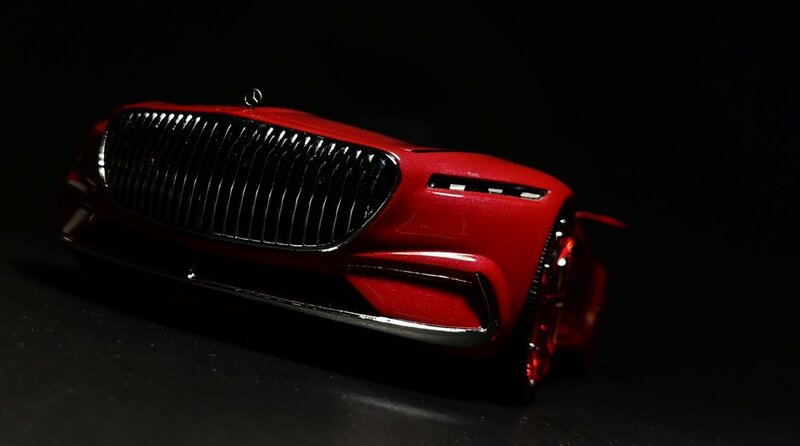 Therefore, it omits a couple of the Vision 6’s unique features, namely the gullwing doors and the split-opening hood. With its sharp shutlines, you would be fooled into thinking this model has opening parts. The paint is well-polished, highly glossy, and show-ready. 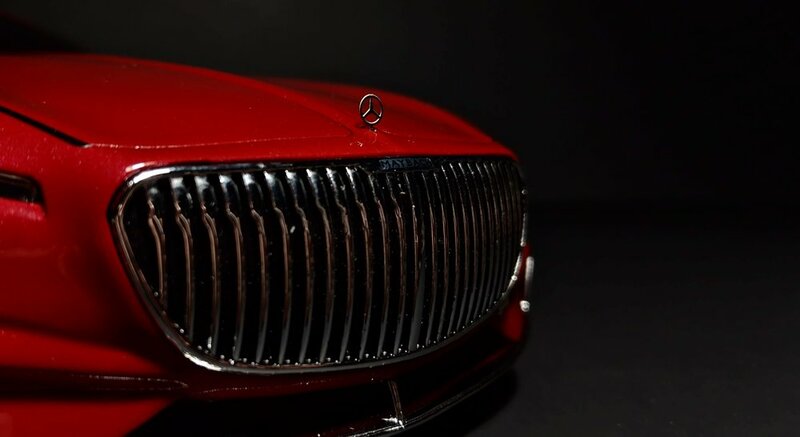 The chrome trim throughout the car is elegant but with some minor imperfections. The windows are blacked out, so there’s no telling whether or not there’s an interior at all. The Vision 6 photographs nicely, but in person there’s something not quite right about the whole thing - and it all falls apart when you look at the wheels and tires. Behind the odd-yet-fascinating clear plastic cover dipped in red, you can see glimpses of the chrome wheel underneath. Without any gaps between each ultra-thin spoke, the whole thing comes across as flat and cheap. Replicating the design exactly would be difficult but not impossible at such a large scale. The tires, too, appear flat(sided) because they don’t have the stretched profile as seen on the real thing. Schuco took the easy way out here, and it’s unfortunate because they missed the mark the distinguishing feature of the Vision 6. For overall accuracy and visual appeal, I recommend the convertible version instead, which features a different wheel design as well as a full interior.